Please refer to our stock # 1291 when inquiring. Miyake Yoji was born in Shimane in 1950, He studied from 1974 under Ito Kosho, establishing himself as an independent artist three years later in Mashiko. In 1979 his work was accepted into the Dento Kogei Shinsaku Ten (New Exhibition of Traditional Crafts) and displayed there annually thereafter. In 1980 he was accepted into the Nihon Dento Kogei Ten (National Traditional Crafts Exhibition), and many times thereafter. 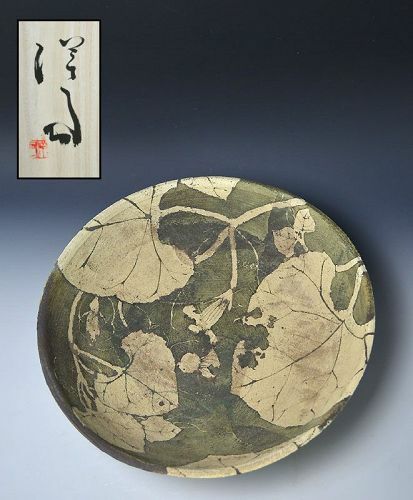 Again the following year he was accepted into yet another major exhibition with the Nihon Togei Ten (All Japan Ceramic Exhibition), once again followed up with repeated acceptance there. Yet in the 90s he turned away from the competitive world and began to concentrate more on private exhibitions, of which he has been hosted many times in some of Japans most prestigious galleries. He was also the subject of an NHK Television Documentary in 1998 and appeared in another in 2000.